The expulsion of long-standing Israeli socialist Moshé Machover from the Labour Party (expulsion letter here) has caused shockwaves throughout the labour movement. We feature motions and statements in support of Moshé and against the ongoing witch hunt by the right in the party. On October 5, Moshe received a second explusion letter, which states that “These allegations [of anti-Semitism] are not subject to an investigation as you are not currently a member of the Labour Party.” They will probably be kept on file, should his expulsion based on his “clear support” for LPM be overturned. This is arbitrary, to say the least. This draft motion (in Word or PDF), taking both letters into account, is currently being discussed in a few branches and CLPs. Feel free to use and amend. This open letter has been started by ‘Free Speech on Israel’ and has already been signed by more than 1,200 Labour Party member – add your name asap! On Tuesday October 3, Professor Emeritus Dr. Moshe Machover was expelled from the Labour Party, based on allegations that he denies. Professor Machover is an Israeli Jew, the distinguished co-founder of the socialist organisation Matzpen, which from the early 1960s to the 1980s brought together Arab and Jewish opposition to the illegal occupation of Palestine. The letter of expulsion does not quote the definition but instead says: “Antisemitism of any form – whether direct attacks or pejorative language which may cause offence to Jewish people – is not acceptable and will not be tolerated in the Labour Party. Language that may be perceived as provocative, insensitive or offensive falls short of the standards expected of us as party members and has no place in the party.” It appears to be referencing the parts of the IHRA definition that were not adopted by the Labour Party. The article in question is a scholarly criticism of Zionism as a political ideology. Professor Machover is accused “of involvement and support for both Labour Party Marxists and the Communist Party of Great Britain (through your participation in CPGB events and regular contributions to the CPGB’s newspaper)”. Prof Machover has denied all allegations, but has not been given the opportunity to challenge them. The Chakrabarti Report found the Labour Party’s “complaints and disciplinary procedures . . . lacked sufficient transparency, uniformity and expertise” and “failed to observe the vital legal principles of due process (or natural justice) and proportionality”. Members deserve to see these principles applied in all disciplinary cases, including that of Professor Machover. This accusation of anti-Semitism will be held on file in the event that after 5 years Professor Machover was to reapply for membership. This action in expelling Professor Machover is arbitrary, lacking in basic justice and is bringing the Labour Party into disrepute. To call for professor Machover’s expulsion to be rescinded and for his immediate reinstatement as a member of the Labour Party. To reject any McCarthyite-style move to expel members for alleged “involvement and support for” other left groups on the basis of writing articles and attending and participating in meetings. It is common practice for Labour members of all levels to speak and participate in events of other groups, and have articles published, representing their individual viewpoints, in a range of publications. Jeremy Corbyn had his own column in the Morning Star for many years. To call on the NEC to investigate the procedures followed to ensure that principles of natural justice are upheld. To submit this this to the next higher unit of the Labour Party (e.g. 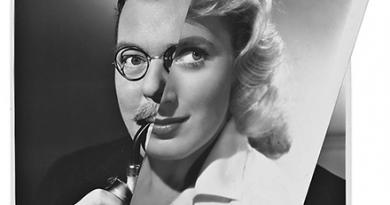 Branch to CLP, CLP to DLP). The Hackney South and Shoreditch Constituency Labour Party calls upon the Labour Party’s Head of Disputes immediately to rescind the expulsion of Professor Moshe Machover, a member of Hampstead and Kilburn CLP, so that due process can take place and Prof. Machover can be given the opportunity to challenge the allegations made against him; and calls for an urgent review of Party disciplinary procedures so that such injustice is not repeated. The voting was 54 in favour, 1 against, and 7 abstentions. Professor Emeritus Moshe Machover, a member of Hampstead and Kilburn CLP, has been summarily expelled from the Party. Prof Machover is Jewish and Israeli, the distinguished co-founder of Matzpen, the socialist organisation which from the 60s to the 80s brought together Arab and Jewish opposition to the illegal occupation of Palestine. He has been found guilty – by the Head of Disputes Sam Mathews, with no due process whatsoever – “of involvement and support for both Labour Party Marxists and the Communist Party of Great Britain (through your participation in CPGB events and regular contributions to the CPGB’s newspaper).” Prof. Machover has never been a member of either organisation. Sam Matthews also accused Prof Machover of writing an “apparently anti-semitic article”. The article in question is a scholarly criticism of Zionism as a political ideology. Prof. Machover denies the accusations, but he has been given no hearing to challenge the allegations and his expulsion. The Chakrabarti Report found the Labour Party’s complaints and disciplinary procedures “… lacked sufficient transparency, uniformity and expertise” and “failed to observe the vital legal principles of due process (or natural justice) and proportionality”. It set out basic principles that the Party should follow in disciplinary cases in future. This CLP believes that the principles recommended in the Chakrabarti Report must be applied in all disciplinary cases. They have clearly not been applied in the case of Moshe Machover. This expulsion is a worrying precedent in a party which is working to be more democratic, and accountable and to adopt disciplinary procedures based on natural justice. This CLP therefore calls for the Labour Party’s Head of Disputes immediately to rescind the expulsion of Professor Moshe Machover, so that due process can take place and Prof. Machover can be given the opportunity to challenge the allegations made against him. 18 Oct 2017: passed overwhelmingly; 58 for, none against and 8 abstentions. The motion to be sent to the leader of the Labour Party, the National Executive Committee (individually), the National Constitutional Committee (individually), the Head of Disputes and Professor Machover. the Head of Disputes has accused Prof Machover of writing an “apparently antisemitic article” according to the new IHRA definition, and further accused him of “membership or support for another political party, or a political organisation with incompatible aims to the Labour Party”. The Chakrabarti Inquiry found that the party’s “. . . complaints and disciplinary procedures . . . lacked sufficient transparency, uniformity and expertise . . .” and called for “the vital legal principles of due process (or natural justice) and proportionality”. 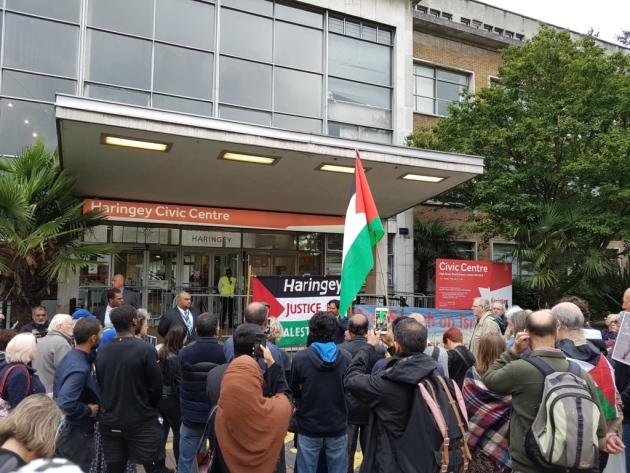 The IHRA definition is being monitored by Camden Council to ensure that it is not used to stifle free expression and criticism of Israeli policies. Prof Machover who denies the accusations, has not been given the opportunity to challenge neither the accusation of antisemitism nor his alleged support for another party or organisation. This expulsion is a frightening precedent in a party which is working to be more democratic and called for, in the words of its leader Jeremy Corbyn, ‘support to end the oppression of the Palestinian people, the 50-year occupation and the illegal settlement expansion’. Prof Machover’s expulsion to be immediately rescinded; the letter informing him of his expulsion to be immediately rescinded; and for any allegations against him to be investigated in accordance with due process to take place so that he is given the opportunity to challenge the claims of the Head of Disputes. And further calls on the Labour party to protect the right of members to contribute to the political debate across numerous platforms, without expressing support for other political parties or views contrary to the values of the Labour party. Professor Moshe Machover, a member of Hampstead and Kilburn CLP, was expelled for writing an article entitled “Anti Zionism does not equal anti- Semitism” in the magazine Labour Party Marxist. Prof. Machover is Israeli and Jewish by origin, a long-time socialist and campaigner for Palestinian rights, and a highly respected academic. The initial expulsion letter on 3 October described his article as “apparently antisemitic” and that it “appears to meet” the International Holocaust Remembrance Alliance (IHRA) definition of antisemitism adopted by the Labour Party. However, the letter appears to reference only the parts of the IHRA definition that were not adopted by the Labour Party. The expulsion was also justified through guilt by association, on the grounds that Labour Party Marxist is a front publication for another political organization. Many other Labour Party members and MPs have written for comparable journals without sanction. Prof. Machover was expelled, not suspended, without the right to defend himself at the disputes meeting, a violation of due process and democratic procedure. The expulsion of Prof. Machover was rescinded in late October following growing protests against it in the Labour Party. Moshe Machover to receive a full and public apology for his summary expulsion, for tarnishing his reputation and for abusing his rights. An urgent review of Party disciplinary procedures to ensure that such an injustice is not repeated. This Otley & Yeadon branch / Leeds North West CLP welcomes the reinstatement as a member of the Labour Party of Professor Moshé Machover. • Professor Machover, who denies the accusations, has still not been given the opportunity to challenge the accusation of anti-Semitism, or his alleged support for another party or organisation. • That all the damaging insinuations of anti-Semitism must be publicly retracted. • A full apology, as requested by Moshé Machover, must be published. • That the whole system that allowed this travesty of justice, and which has brought the Party into disrepute, must be fully investigated by the NEC, and reformed, and those who instigated this damaging course of action held to account. • That the Party establishes a clear and transparent disciplinary procedure based upon Trade Union best practice on discipline of members. Natural justice : not procedural unfairness based upon prejudice. • That all the recent expulsions and suspensions be reviewed and must be revoked where there is no clear evidence of breach of rule. To submit this motion to the next higher unit of the Labour Party (e.g. Branch to CLP). This branch calls upon the Labour Party’s Head of Disputes immediately to rescind the expulsion of Professor Moshe Machover, a member of Hampstead and Kilburn CLP, so that due process can take place and Prof. Machover can be given the opportunity to challenge the allegations made against him. As outlined in a statement from the Jewish Socialists’ Group, Moshe Machover – a lifelong Israeli socialist, anti-racist and anti-imperialist, who has lived in Britain since 1968 – has been expelled from the Labour Party accused of writing “an apparently antisemitic article” and accused of “involvement and support for” two organisations, the Labour Party Marxists and the Communist Party of Great Britain. The accusation regarding the “antisemitic” article references the controversial, flawed definition of antisemitism, which the JSG and many others on the left have challenged. The article by Moshe that has been cited is a critique of the political ideology of Zionism, not of Jews. Indeed the article exposes antisemitic ideas. As the JSG further notes, the action against Professor Machover represents a McCarthyite-style attempt to expel members for alleged “involvement and support for” other left groups on the basis of writing articles and attending and participating in meetings. It is common practice for Labour members of all levels to speak and participate in events of other groups, and have articles published, representing their individual viewpoints, in a range of publications. According to the Chakrabarti Report, the Labour Party’s “. . . complaints and disciplinary procedures . . . lacked sufficient transparency, uniformity and expertise . . .” and failed to observe “the vital legal principles of due process (or natural justice) and proportionality”. Members deserve to see these principles applied in all disciplinary cases, including Moshe Machover’s is a critique of the political ideology of Zionism, not of Jews. Indeed the article exposes antisemitic ideas. According to the Chakrabarti Report, the Labour Party’s “. . . complaints and disciplinary procedures . . . lacked sufficient transparency, uniformity and expertise . . .” and failed to observe “the vital legal principles of due process (or natural justice) and proportionality”. Members deserve to see these principles applied in all disciplinary cases, including Moshe Machover’s. chair and secretary of Larkswood & Valley Branch and of the CLP. The article by Moshe Machover, that has been cited, is a critique of the political ideology of Zionism, not of Jews. Indeed the article exposes antisemitic ideas. Evidence presented in the expulsion letter sent to Prof Machover by Sam Matthews appears in the form of articles written for the CPGB paper Weekly Worker and a report of a discussion in which Prof. Machover participated. The 2016 Chakrabarti Report found the Labour Party’s “complaints and disciplinary procedures . . . lacked sufficient transparency, uniformity and expertise” and “failed to observe the vital legal principles of due process (or natural justice) and proportionality”. The report’s recommendations have been adopted by the NEC. This branch therefore calls upon the Labour Party’s Head of Disputes to rescind the expulsion of Professor Moshe Machover immediately, so that due process can take place and he will have the opportunity to challenge the allegations made against him. Emeritus Professor Moshe Machover, a member of Hampstead and Kilburn CLP, was expelled from the Labour Party on 3 October. Professor Machover, 81, is a lifelong Israeli socialist, anti-racist and and campaigner for social justice in Israel/Palestine, and a distinguished academic in the fields of Logic, Philosophy and Mathematics. Professor Machover denies that he is or ever has been a member of either of the organisations that have been cited [the ‘Communist Party of Great Britain’ and a group called ‘Labour Party Marxists’]. He has on occasion written for CPGB publications and spoken at their events, as have other non-members. The same principle could be used to expel prominent party members and trade unionists who have written for the Morning Star, in effect the paper of the Communist Party of Britain; or appeared on platforms and suppported events organised by Unite Against Fascism which was launched by the SWP. His only right of appeal is to submit evidence to the same official who expelled him. He should instead be entitled to be treated according to the principles accepted by the NEC and still not brought into force. We further call on the Labour party to protect the right of members to contribute to the political debate across numerous platforms, without expressing support for other political parties or views contrary to the values of the Labour party. Last night, St Michael’s Branch Labour Party, the largest branch in Liverpool Riverside Constituency Labour Party, itself the second largest CLP in the country by membership, voted unanimously to call for the re-instatement of Prof Moshe Machover, the noted mathematician and anti-Zionist Israeli socialist. Sherwood Branch Labour Party condemns the expulsion of Professor Moshe Machover, before any hearing of evidence against him, from the Labour Party. He has been accused of ‘membership or support for another political party, or a political organisation with incompatible aims of the Labour Party’, based on him having articles published and participating in meetings. This branch notes the expulsion has been justified though a process of guilt by association and was sparked by a totally unfounded allegation that Professor Machover, who is Israeli and Jewish by origin, wrote an antisemitic article. This allegation is based highly selective quoting from a long and closely argued article and by an extreme interpretation of the International Holocaust Remembrance Association working definition of antisemitism that “pejorative language which may cause offence to Jewish people” is antisemitic. This branch therefore demands from the Party: his immediate reinstatement; an apology for such tarnishing of his reputation; and an urgent review of Party disciplinary procedures so such an injustice is not repeated. And to support Mark Wadsworth and all other members suspended over similar charges. The Wanstead Branch of the Labour Party condemns the expulsion of Professor Moshe Machover, before any hearing of evidence against him, from the Labour Party. This original letter of expulsion addressed two things. The branch notes that the expulsion has been justified through a process of guilt by association and was sparked by a totally unfounded allegation that Professor Machover, who is Israeli and Jewish by origin, wrote an antisemitic article. This allegation is based on highly selective quoting from a long and closely argued article and by an extreme interpretation of the International Holocaust Remembrance Association working definition of antisemitism that “pejorative language which may cause offence to Jewish people” is antisemtic. The second issue cited in Professor Machover’s expulsion letter and in the updated letter of expulsion upon which his expulsion was based relates to his membership in, or support of, the Communist Party of Great Britain and Labour Party Marxist. Professor Machover denies this. The fact that Professor Machover was unable to defend himself at the disputes meeting is a violation of due process and democratic procedure. The branch therefore demands from the Party that the Labour Party’s Head of Disputes immediately rescind the expulsion of Professor Moshe Machover, a member of Hampstead and Kilburn CLP, so that due process can take place and Professor Machover can be given the opportunity to challenge the allegations made against him. We also ask that an urgent review of Party disciplinary procedures is undertaken so that such an injustice is not repeated. 2) Rescind immediately the letter informing Professor Machover of his expulsion. First, the allegations against Mr. Machover are unsubstantiated; and, second, the process through which the decision to expel him was taken seems to have him guilty until proved innocent, rather than presumed innocent until proved guilty. The letter to Professor Machover and the apparent lack of process seem both unworthy of the Labour Party and unjust. Emeritus Professor, Moshe Machover, a member of Hampstead and Kilburn CLP, was expelled from the Labour Party on 3 October.Professor Machover, 81, is a lifelong Israeli socialist, anti-racist and and campaigner for social justice in Israel/Palestine, and a distinguished academic in the fields of Logic, Philosophy and Mathematics. Professor Machover regards the allegation about the article as malicious and totally unfounded. He denies that he is a member of either of the organisations that have been cited. The 2016 Chakrabarti Report found the Labour Party’s “complaints and disciplinary procedures . . . lacked sufficient transparency, uniformity and expertise” and “failed to observe the vital legal principles of due process (or natural justice) and proportionality”. The report’s recommendations have been adopted by the NEC. Members deserve to see these principles applied in all disciplinary cases. This branch calls upon the Labour Party’s Head of Disputes to rescind the expulsion of Professor Machover immediately, so that due process can take place and he will have the opportunity to challenge the allegations made against him. The letter of expulsion does not quote the definition but instead says: “Antisemitism of any form – whether direct attacks or pejorative language which may cause offence to Jewish people – is not acceptable and will not be tolerated in the Labour Party. Language that may be perceived as provocative, insensitive or offensive falls short of the standards expected of us as party members and has no place in the party.” It appears to be referencing the parts of the IHRA definition that were notadopted by the Labour Party. To call for his expulsion to be rescinded and for his immediate reinstatement as a member of the Labour Party. Emeritus Professor, Moshe Machover, a member of Hampstead and Kilburn CLP, was expelled from the Labour Party on 3 October. Professor Machover, 81, is a lifelong Israeli socialist, anti-racist and and campaigner for social justice in Israel/Palestine, and a distinguished academic in the fields of Logic, Philosophy and Mathematics. Professor Machover regards the allegation as malicious and totally unfounded. He denies that he is a member of either of the organisations that have been cited. On Thursday 5th October 2017 East Dulwich branch in Dulwich and West Norwood CLP passed the following resolution condemning the expulsion of Moshe Machover by 20 to 0 with one abstention. This branch/CLP calls upon the Labour Party’s Head of Disputes immediately to rescind the expulsion of Professor Moshe Machover, a member of Hampstead and Kilburn CLP, so that due process can take place and Prof. Machover can be given the opportunity to challenge the allegations made against him. This Branch notes the NEC policy that auto-exclusions ceased following the party’s adoption of the recommendations of the Chkrabarti Report, that the Party’s policy is now to follow due process, based on natural justice, in relation to disciplinary procedures. The proper application of this policy is pertinent to a very recent case where a long standing member of Hampstead and Kilburn Branch, MM, has been expelled without due process, having not been informed in advance of the action, not having been suspended pending investigation, and where the grounds for expulsion are not even that he is, or ever has been, a member of a proscribed organisation (he has, in fact, never been a member of the organisations cited). The grounds are that he has attended their public meetings and has had articles published in their journals. In none of the articles cited as evidence did MM in any way advocate support for these organisations nor advocate opposition in any way whatsoever to the Labour Party. The Chakrabarti Report, found the Labour Party’s “. . . complaints and disciplinary procedures . . . lacked sufficient transparency, uniformity and expertise . . .” and “failed to observe the vital legal principles of due process (or natural justice) and proportionality”. The summary expulsion this week of MM is a deeply disturbing repetition of this bad practice and heralds a serious curtailment of free speech within the Party. It sets a frightening precedent and flies in the face of a party which is working to be more democratic and accountable and to adopt procedures based on natural justice. This Branch therefore calls for the Labour Party’s Head of Disputes immediately to rescind the expulsion of MM, a member of Hampstead and Kilburn CLP, so that due process can take place, and MM can be given the opportunity to challenge the allegations made against him in proper hearings. The Israeli socialist and long-time campaigner for Palestinian rights, Moshe Machover, has been expelled from the Labour Party for writing an article entitled “Anti Zionism does not equal anti-Semitism”. The expulsion letter from the head of disputes, Sam Matthews, describes the article as “apparently antisemitic” and that it “appears to meet” the International Holocaust Remembrance Alliance definition of antisemitism which has just been adopted by the Labour Party. The letter does not quote the definition but instead says: “Antisemitism in of any form – whether direct attacks or pejorative language which may cause offence to jewish people – is not acceptable and will not be tolerated in the Labour Party. Language that may be perceived as provocative, insensitive or offensive falls short of the standards expected of us as party members and has no place in the party.” It appears to be referencing the parts of the IHRA definition that were not adopted at the conference. Moshe has been expelled, not suspended, without the right to defend himself, on the grounds that the publication concerned, Labour Party Marxist, is regarded as a front publication for another political organization, even though there are many examples of Labour members and politicians writing for comparable journals. This action is arbitrary, lacking in basic justice and is bringing the Labour Party into disrepute. 1. We fully support Moshe Machover and call for his expulsion to be rescinded and for his immediate reinstatement as a member of the Labour Party. 2. We reject any McCarthyite-style move to expel members for alleged “involvement and support for” other left groups on the basis of writing articles and attending and participating in meetings. It is common practice for Labour members of all levels to speak and participate in events of other groups, and have articles published, representing their individual viewpoints, in a range of publications. 3. We call on the NEC to investigate the procedures followed to ensure that principles of natural justice are upheld. On Tuesday 3rd October, Labour Party member Professor Emeritus Dr. Moshe Machover was summarily expelled from the Labour Party, based on allegations which he denies. Dr. Machover is Jewish and Israeli, the distinguished co-founder of Matzpen, the socialist organisation which from the early 1960s to the 1980s brought together Arab and Jewish opposition to the illegal occupation of Palestine. Dr Machover has been an activist for decades and is an asset to the Labour Party. It is an act of self-harm to expel such a valuable member. However, we would be demanding reinstatement for any member, regardless of their political perspective who has been treated like this because we are equally concerned that this action was taken without a clear and transparent process ‘in accordance with the principles of natural justice and proportionality”. These were within the recommendations of the Chakrabarti Review, which seem to have been largely ignored. These included looking at other penalties short of suspension and expulsion . 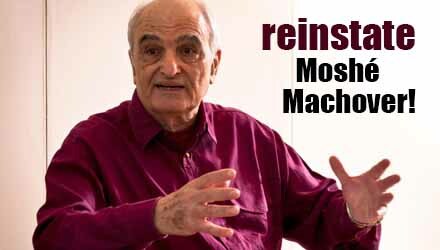 We demand the immediate reinstatement of Moshe Machover and a public apology. In addition we demand a clear and public assurance that no member of this Party will again be treated in such an appalling manner and that in future, any actions will be taken only following such a clear process, as outlined in the Chakrabarti Report.We are also very concerned at the apparent misuse of the IHRA definition of antisemitism to stifle free expression, including the right to non abusive criticism of the State of Israel as we had outlined in our own Rule change. We insist that the Party firmly commits to uphold the right to non abusive free speech in all its political discourse. the Head of Disputes has accused Prof Machover of writing an “apparently antisemitic article” according to the new IHRA definition, and further accused him of “membership or support for another political party, or a political organisation with incompatible aims to the Labour Party” on the basis of “participation in CPGB events and regular contributions to the CPGB’s newspaper, the Weekly Worker”. Prof Machover who denies the accusations, has not been given the opportunity to challenge either the accusation of antisemitism nor his alleged support for another party or organisation with incompatible aims to the Labour Party. Prof Machover’s expulsion to be immediately rescinded and for due process to take place so Prof Machover is given the opportunity to challenge the claims of the Head of Disputes. Holme Valley North Labour Party calls upon the Labour Party’s Head of Disputes to immediately rescind Professor Moshe Machover’s expulsion, and for any allegations against him to be investigated in accordance with due process and natural justice, so that he is given the opportunity to challenge those allegations made against him. + chair and secretary of the three other C&WG branches and of the CLP. Professor Emeritus Moshe Machover has been expelled from the Party. Professor Machover is Jewish and Israeli, the distinguished co-founder of Matzpen, the socialist organisation which from the 60s to the 80s brought together Arab and Jewish opposition to the illegal occupation of Palestine. Professor Machover who denies the accusations, has not been given the opportunity to challenge either the accusation of anti-Semitism nor his alleged support for another party or organisation. Momentum Sheffield condemns the expulsion of Moshe Machover from the Labour Party and calls for his immediate reinstatement. We oppose all McCarthyite auto-exclusions on political grounds, which have chiefly been used to get rid of Corbyn supporters from the Labour Party. The meeting on October 17 unanimously agreed the following motion. 1:1 On Tuesday October 3, Professor Emeritus Dr. Moshe Machover was expelled from the Labour Party, based on allegations that he denies. Professor Machover is an Israeli Jew, the distinguished co-founder of the socialist organisation Matzpen that, from the early 1960s to the 1980s, brought together Arab and Jewish opposition to the illegal occupation of Palestine. 1:2 This expulsion was initially based on two charges. 1:3 Professor Machover was also accused “of involvement and support for both Labour Party Marxists and the Communist Party of Great Britain (through participation in CPGB events and regular contributions of the CPGB’s newspaper the Weekly Worker).” Comrades Machover denies membership of both groups. 2:1 The letter of expulsion does not quote the IHRA definition but instead states: “Anti- Semitism of any form – whether direct attacks or pejorative language which may cause offence to Jewish people – is not acceptable and will not be tolerated in the Labour Party. Language that may be perceived as provocative, insensitive or offensive falls short of the standards expected of us as party members and has no place in the party.” This appears to be referencing the parts of the IHRA definition that were not actually adopted by the Labour Party. 2:3 The content of the Chakrabarti Report that states that the Labour Party’s “complaints and disciplinary procedures . . . lacked sufficient transparency, uniformity and expertise” and “failed to observe the vital legal principles of due process (or natural justice) and proportionality”. Members deserve to see these principles applied in all disciplinary cases, including that of Professor Machover. 1:3 That comrade Machover wrote an article entitled ‘Anti Zionism does not equal anti- Semitism’. According to a letter from the Labour Party’s Head of Disputes, Sam Matthews, this article was “apparently anti-Semitic” and “appears to meet” the International Holocaust Remembrance Alliance definition of anti-Semitism which has just been adopted by the Labour Party. The article in question is a scholarly criticism of Zionism as a political ideology. 3:1 Regards the expulsion pf Professor Machover as arbitrary, lacking natural justice and is bringing the Labour Party into disrepute. 3:2 Rejects any McCarthyite-style moves to expel members for alleged “involvement and support for” left groups based simply on them contributing articles to their journals or attending/accepting invitations to speak at their meetings. It is common practice for Labour members at all levels of the party to speak at and participate in events of other organisations, and have articles published, representing their individual viewpoints, in a range of publications. Eg, Jeremy Corbyn had his own column in the Morning Star for many years. 3:3 Calls on the NEC to investigate the procedures followed in this case to ensure that principles of natural justice are upheld. 3:4 Demands that Professor Machover’s expulsion is immediately rescinded and he is immediately reinstatement as a member of the LP. Professor Emeritus Moshe Machover is the first person accused of antisemitism to be expelled following the newly implemented Labour Party rule change, and following the Labour Party’s partial acceptance of the IHRA definition of antisemitism. Prof Machover is Jewish and Israeli, the distinguished co-founder of Matzpen, the socialist organisation which from the 60s to the 80s brought together Arab and Jewish opposition to the illegal occupation of Palestine. His expulsion without any due process was as a result of an accusation which remains anonymous. Calls on Momentum’s National Coordinating Group (NCG) to demand the immediate reinstatement of Professor Machover’s Labour Party membership and for due process and natural justice to be implemented in accordance with the recommendations of the Chakrabarti Inquiry, affording Professor Machover the opportunity to refute the charges. Calls on Momentum members to pass resolutions in whatever CLPs they belong to, demanding reinstatement and due process for Professor Machover. Momentum’s National Coordinating Group (NCG) unilaterally decided to support a rule change at the Labour Party conference initiated by the right wing Jewish Labour Movement and modified by the NEC on “Conduct Prejudicial to the Party” with particular reference to protected groups. Like the NEC, the NCG made the decision without consultation with those same protected groups inside Momentum and without consultation with Momentum’s local groups. Momentum’s NCG was elected by barely a third of the membership of Momentum at the time, and less than one quarter of the present membership. Once elected the NCG chose as their chair a person who has never stood for, nor been elected to, the NCG by the membership of Momentum. He is a member of the NCG based on his appointment by “Left Futures”. Momentum has been at the forefront of the fight for a more democratic Labour Party that respects and reflects the will of the vast majority of its members. Calls on the NCG to institute immediately a consultative process with the more than 170 local groups and 30,000 members, and with those sectors named in the Labour Party rule book as facing particular discrimination, before making any more sweeping policy decisions. Calls on Momentum groups to support Momentum Camden’s call for a more democratic, consultative process within our own organisation by making their views known to the NCG. “We, the member of The Merseyside Pensioners Association wish to protest strongly against the expulsion of Professor (Emeritus) Moshe Machover from the Labour Party on the grounds that he allegedly made anti-semitic remarks in an article in a publication of a Marxist group, of which he is not a member. We understand that Moshe is a lifelong Marxist and socialist and, therefore, would reject all forms of racism. We understand that he wrote articles critical of the actions of the Zionist settler-colon state of Israel, of which he is a citizen. We believe that such criticisms cannot be construed as anti-Semitism, which can be properly defined as dislike and/or mistreatment of Jewish people simply because they are Jews. We believe such treatment of Moshe Machover brings the Labour Party into disrepute. He is a distinguished, world-famous mathematical logician, and has contributed, with an Israeli comrade, to the development of deeper understanding of Marxian economic theory by applying ideas from physics. This has created a new branch of Marxian economics, ‘Econophysics’, which has many followers, especially in Germany and other parts of Europe. We also believe that he and his Israeli comrade also helped to found the Arab-Jewish socialist party in Israel, called Matzpan. support Shami Chakrabarti’s desire to encourage respectful free speech within the Party.The JSG chooses to support individuals suspended or expelled from the party on a case by case basis. In this case we fully support Moshe Machover and call for his expulsion to be rescinded and for his immediate reinstatement as a member of the Labour Party. The JSG recognises the article by Moshe Machover, that has been cited, as a critique of the political ideology of Zionism, not of Jews. Indeed the article exposes antisemitic ideas. The JSG rejects any McCarthyite-style attempt to expel members for alleged “involvement and support for” other left groups on the basis of writing articles and attending and participating in meetings. It is common practice for Labour members of all levels to speak and participate in events of other groups, and have articles published, representing their individual viewpoints, in a range of publications. The following resolution was passed unanimously.It will go to UNISON regionally and nationally as well as to Brighton & Hove Trades Council. “This branch deplores the decision to expel Emeritus Professor and distinguished mathematician Moshe Machover from the Labour Party for alleged ‘anti-semitism’. Moshe is an Israeli citizen of Jewish heritage who has been a life-long critic of Zionism and of Israel which he has defined as a ‘settler/colon state’. He is a life-long socialist and committed opponent of all forms of racism. We consider this expulsion to be an example of attempts to re-define anti-semitism so as to include all critics of Zionism and of Israel. We further call for an end to all suspensions and expulsions from the Labour Party on the basis of people’s political views or membership of political groups. No expulsions should take place without an investigation and hearing before the National Constitutional Committee. We call for the recommendations of the Chakrabarti Report concerning natural justice and transparency to be implemented immediately. The nasty witch-hunters nested in Labour’s national apparatus ought to have bitten off more than they can chew with the outrageous expulsion of Moshe Machover. Anti-racists, supporters of Palestine and longstanding socialists in Britain will know him mainly through his lifelong socialist commitment and opposition to the apartheid structure of the Israeli state, forged out of his experiences being born and growing up there.He was a founder of Matzpen, the revolutionary internationalist socialist group in Israel.His publications and writings on Israel-Palestine, often with Akiva Orr and Jabra Nicola, remain seminal. “The Class Nature of Israeli Society” is a must read for anyone trying to understand the Palestinian struggle and zionism from an internationalist and anti-imperialist standpoint – or at all, I would say. But perhaps less well known on the left is that Professor Machover is a highly distinguished mathematician and logical philosopher.I don’t know the undergraduate curriculum these days, but his primer (with Bell) “A Course in Mathematical Logic” was a set text (excuse the pun) on the Mathematics and Philosophy course in Oxford 30 years ago. He has made major advances in set theoretic logic. As Professor of Mathematics at the University of London he contributed enormously to the development of the department at King’s College and other campuses. There is a far wider body of opinion than even the considerable pro-Palestinian sentiment in Britain and its labour movement who will be nothing short of incensed at this expulsion. That his son Daniel is also a well regarded human rights lawyer expands the field further.Mathematicians and logicians are not often the most political of people. But they are usually rather good at distinguishing bogus arguments from truth and sound reasoning. .From Aberdeen to Bristol it ought to be taken not just to left political layers, but into every department of mathematics, philosophy and logic. Indeed, beyond Britain.And with a clear message back to the Labour leadership regarding the Blair-era bureaucrats who are disfiguring Labour: The Philistines are upon you. Reason in revolt now thunders. Your involvement and support for both LPM [Labour Party Marxists, claimed to be a front for the Communist Party of Great Britain in the letter] and the Communist Party of Great Britain (through your participation in CPGB events and regular contributions to the CPGB’s newspaper, the Weekly Worker) is documented in Section 3 of the attached evidence. Membership or support for another political party, or a political organisation with incompatible aims to the Labour Party, is incompatible with Labour Party membership. You are therefore ineligible to remain a member of the Labour Party and have been removed from the national membership system. You are no longer entitled to attend local Labour Party meetings. The Labour Party’s International Department used to be almost entirely populated by cold-war warriors in times gone by. It seems that such predilections remain alive in Southside with its talk of Communist Front organisations. While the rest of us read le Carré for relaxation, some in the Labour Party seem to read him for instruction. Even worse that the talk of Fronts are the lessons taken from the US House Un-American Activities Committee of the forties and fifties, where Richard Nixon made his name, with its pattern of Guilt by Association. Can we expect Professor Machover to next be granted absolution by naming names in front of the NCC, the Labour Party body responsible for discipline, to give them a cast-list for the next act of their expulsion drama? These allegations relate to an apparently antisemitic article published in your name, by the organisation known as Labour Party Marxists (LPM). The content of these articles appears to meet the International Holocaust Remembrance Alliance definition of antisemitism, which has been adopted by the Labour Party. Evidence relating to these allegations can be found in Section 1, overleaf. Antisemitism of any form – whether direct attacks or pejorative language which may cause offence to Jewish people – is not acceptable and will not be tolerated in the Labour Party. Language that may be perceived as provocative, insensitive or offensive falls short of the standards expected of us as Party members and has no place in our party. Simultaneously, another Jewish anti-Zionist, Moshe Machover, was also putting the boot in: this time a Nazi jackboot belonging to Reinhard Heydrich, one of the primary architects of the Final Solution. Machover wrote a special “Anti-Zionism does not equal anti-Semitism” article for Labour Party Marxists to distribute at the Conference, which quoted Heydrich making “a friendly mention of Zionism”. This, despite the notorious Nazi’s quote beginning with the words “National socialism has no intention of attacking the Jewish people in any way”. This is the depths that some Jewish anti-Zionists will reach, just to savage their Zionist co-religionists. National socialism has no intention of attacking the Jewish people in any way. On the contrary, the recognition of Jewry as a racial community based on blood, and not as a religious one, leads the German government to guarantee the racial separateness of this community without any limitations. The government finds itself in complete agreement with the great spiritual movement within Jewry itself, so-called Zionism, with its recognition of the solidarity of Jewry throughout the world and the rejection of all assimilationist ideas. On this basis, Germany undertakes measures that will surely play a significant role in the future in the handling of the Jewish problem around the world. In other words, a friendly mention of Zionism, indicating an area of basic agreement it shared with Nazism. Of course, looking back at all this, it seems all the more sinister, since we know that the story ended with the gas chambers a few years later. This overlap is an indictment of Zionism, but the actual collaboration between the two was not such an exceptional thing, when you accept that the Zionists were faced with the reality of an anti-Semitic regime. Moshé has written elsewhere that for any historian the facts must come first and the moral judgement after. The Zionists appear only to want convenient facts made available, and the facts are allowed or disallowed on the basis of the a priori moralism. We may observe this is an approach to history also shared by Michael Gove. Gove was excoriated by a brigade of reputable historians where he tried to see this as a basis for the school history curriculum. We would expect Labour Party employees to have a more reliable moral and intellectual compass than Gove. Sadly, reasonable expectations evaporate when you come within sight of Southside. Our catalogue of alarm has at least one further item. The Party thought-police have extended their interpretation of the IHRA (mis)definition of Antisemitism beyond our worst nightmares. According to the letter “pejorative language which may cause offence to Jewish people” is antisemitic. Well I find the pejorative language that the Party has used about Professor Machover to be deeply offensive to me as human being but also as a Jew and consequently I demand that all those involved in drawing up and agreeing this letter to expel themselves from the Labour Party forthwith. This demand may have little evidential basis but it has no more and no less than their letter of excommunication. The implications of such an interpretation are horrendous. It is true that many British Jews find criticism of Israel’s record offensive. This is their right no matter how distorted we perceive the worldview that affords such a reaction. How far we should indulge a view that excuses the suppression of Palestinian rights is a political judgement that Labour Party officials have got very, very wrong. The Party’s responsibility, as a Party that places a high value on Human Rights in Britain and internationally, is to engage with those who jump to offence mode to help them find a more justice-based reaction to words and events. Many local Labour Parties are adopting resolutions condemning Moshé’s expulsion, many more should do so. We have allowed too many messengers to be shot. We must not allow Moshé to be one more. Free Speech on Israel will be part of that fight.